Yes, it’s time again to share all your wonderful sewing projects and inspire others to try something a little different. 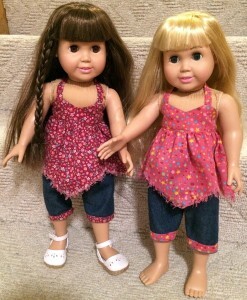 Now I don’t normally feature full size clothing in my Share and Tell blog but I’m super impressed with Amy, who as a young girl did my How to Sew Doll Clothes video course a couple of years ago. She now has the confidence to take clothes she doesn’t wear and transform them into lovely garments that she can proudly wear. 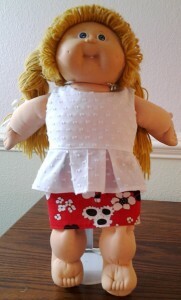 Cindy has been very creative making this terrific outfit for her Cabbage Patch doll. I absolutely love this idea! Cindy has turned a plain crop top into a classy peplum top. It turned out really well, looks super smart paired with the straight skirt and I love the texture in the fabric Cindy has used too! Karen’s done a fantastic job with my handkerchief top and capri pants patterns. 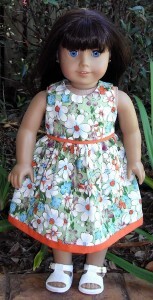 ‘I have been sewing American Girl doll clothes for several years. I fell in love with your adorable handkerchief top pattern over a year ago, and am so glad I finally bought it! 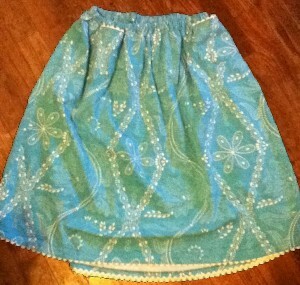 The special fraying effect makes this top one of my favorite patterns of all time. I’ve enclosed a pix or 2 of the tops I’ve made so far… I have 6 more cut out and ready to make! Thanks for designing such a unique pattern! I must admit that this is one of my favorite patterns too and red and navy always look great together! 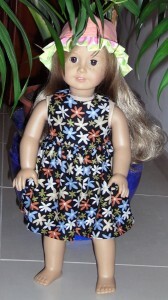 Jenny has been very busy making lots of summer outfits for her daughter’s dolls. It’s great to see that she is experimenting to create her own unique outfits. The summer dress looks great with the trim and just as cute without. 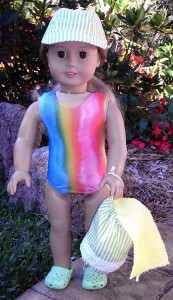 Love that rainbow fabric of the one piece swim suit, it reminds me of a lolly pop and the beach bag is really sweet too. Not sure what pattern Jenny has used for the cap but it’s great to see dolls protecting themselves in the sun. And this is my favorite. Jenny has used my halter top pattern and extended it down to the length of a dress. She has added a little width at the bottom and has just hemmed it all around before turning the top casing down, rather than lining it. What a fantastic idea for a cute summer halter dress! Thanks everyone for sending in your photos, I absolutely love receiving them and I know my readers enjoy seeing them too.